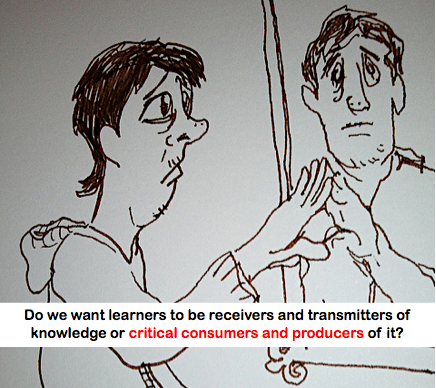 Where is reflection in the learning process? What was your significant learning this past week? What principles for everyday life can you extract from our class activities? (Note: The activities are experiential). I asked the students to get in small groups to discuss these questions. They got in their groups and just looked at one another with baffled looks on their faces while remaining silent. I tried rewording the questions and providing examples and still got blank looks when they returned to their group discussions. I began to get frustrated by their lack of response until a major AHA struck me . . . They are products of a standardized system where they were asked to memorize standardized information and spit that information out on standardized tests. When finished with one unit of information, they were asked to quickly move onto the next unit. They were not given the time, skills, and opportunities to extract personalized meanings from their studies. Reflection was not part of their curriculum as it cannot be measured nor tested. There are those who believe as I do that deep, meaningful, long-lasting learning is left to chance if it is not a strategic, integrated part of the learning process. Critical reflection is an important part of any learning process. Without reflection, learning becomes only an activity — like viewing a reality TV show — which was never meant to have meaning, but was only meant to occupy time. Critical reflection is not meditation, rather it is mediation — an active, conversive, dialectical exercise that requires as much intellectual work as does every other aspect of the learning process, from analysis to synthesis to evaluation. But in reflection, all the learned material can be gathered about, sorted and resorted, and searched through for greater understanding and inspiration (https://canvas.instructure.com/courses/612829/wiki/heres-what-to-do-on-saturday). When I entered my doctoral program, I was quickly introduced to David Schon’s Reflective Practitioner (in an adult learning course), and was immediately drawn to to importance of reflective practice. Later, as a counselor and teacher educator, I have held tightly onto the belief that good counselors and educators need to be engaged in ongoing reflective practice. The only way that educators can teach and promote reflective practice by their students (of all ages) in their own classrooms is to engage in, embrace, and fully understand this process themselves. If reflective practice is not encouraged within one’s teacher education program or school work environment, then it becomes that educator’s responsibility (verging on an ethical responsibility) to do so on his or her own. Structuring lesson plans to support reflective thinking. Providing lesson components that prompt inquiry and curiosity. Providing resources and hand-on activities to prompt exploration. Providing reflective thinking activities that prompt students to think about what they have done, what they learned, and what they still need to do. There are specific classroom activities that can assist students in engaging in reflective practice. I further discuss reflection as part of the learning process in The Flipped Classroom: The Full Picture. Great post, Jackie! Reflection requires one to stop, look inward, observe, and express those thoughts and observations via writing. This is so foreign to students from the standardized test mills we call schools today. It is one of the reasons that Senior Project® and other capstone projects are often considered ‘too hard’ by students and parents. Each step in the process of completing a rigorous, multi-component project requires reflection through journaling, e-portfolio compiling, and self-assessments that most students have not encountered before. It is also why these projects are recognized by so many schools, districts, and states as necessary to prepare students for the skills of college and work. I’d suggest that your college freshmen most likely fall into two camps…..those who completed senior capstones (of merit and rigor) and those who did not. Sounds great and smart. I wonder how many students of any age could possibly handle anything so…radical…as stopping to think about what it is they have learned (and why) and where (if at all) it fits into their life and set of skills. It is not clear from your blog where you live and work, but in the U.S. I imagine teachers outside of a very few classrooms would have a tough time asking students to do something — albeit important — that the larger culture derides and devalues. The U.S. wants students who are docile, obedient and ready to fit into the corporate/capitalist model. Questioning and reflecting are deeply at odds with this aim. Yes – sadly, I agree with your comment regarding the state of affairs in the US . . . but doesn’t mean those of us involved in educational reform have to agree and accept it. Hi Jackie, I am Luciana Allan from Instituto Crescer (www.institutocrescer.org.br) – Brazil. I am following your blog and I love. Your ideas has a lot of sinergy with my ideas about education and teacher’ love. I would like to talk more with you and see the possibility to develop some projects toghether. Here, in Brazil, I am an expert in teacher’trainning process. Can we organize a skype? Hi Luciana – would love to do a Skype with you. I am not sure what reference – could you give me a little information? I most certainly see your point, here. However, I think the key is for those of us to “get” this to make it happen in spite of the system and society within which we find ourselves. The US may want students who fit those characteristics, but I can assure you that many of the teachers in US classrooms do not. For clarification, I teach public high school in small rural school district in northeastern Pennsylvania. There are no bells-and-whistles, here. Budget cuts are killing us and at first glance, it would seem we easily fit the mold you describe above. Great post, Jackie! I’m right there with you on the importance of reflection and trying hard to teach my high school students this now. Teachers who care “get” it and “do” it – no matter what the climate. Thanks for the response, Suzie. FYI – I grew up in Kingston/Wilkes-Barre, PA – where do you teach? Yes, agreed, no matter what the climate… it’d be nice, occasionally, though if the climate were better. It would just make it less of an uphill battle to help our students ‘unlearn’ and ‘relearn’. Great article. And yes we have “taught” our students to be passive recipients of their education and we will have to teach them to become more self-directed. Can’t be upset with them. Thanks for the collegiate insights. Great post Jackie! Reflection is the key to improvement – both as an educator and as a learner. You are correct in saying that perhaps we don’t spend enough time reflecting. My blog helps me reflect as a learner and an educator. As a trainer, I consciously try to include reflective practices and activities through out the training. But I can’t say it is easy. It takes time, effort and interest. Great article Jackie! How much of this do you think is embedded within the education system? Everything is focused on standardized testing and achieving “base” education, but the rub is no one understands why they are learning a concept and can relate to why it’s important (or should be) important to them. In the workplace we’re often asked “why something is important” and without having experience to reflect and consider those questions to justify and backup a viewpoint you’re not going far. In K-8 the reflective process can be reinforced with simple blogs asking “What I learned today.” In higher grades more reflection on why the believe something is important or even challenging a specific viewpoint. The who creative process could be documented in an ePortfolio (or some other method) when creating an essay and why they chose certain resources over others. In Math we’re often asked to show how we achieved a solution in order for partial marks or where the instructor can find out where you went wrong and maybe even award extra marks for creativity. This can be applied to almost every subject (I think I may do this with my kids when they’re old enough to start typing sentances!). It would be nice to take an ePorfolio system and have it live from the start of your education career until you’re in the grave so you can continously look and reflect throughout your life. Love the way you are thinking. HAve you ever noticed how bad we are as professionals with our own professional education? Most professional training opportunities are so full of input that I often hear delegates suggesting they need another day just to sort out what they think about the training they have received. This is an interesting introduction to reflection as an educational concept but takes it more in its common-sense meaning. Reflection perhaps is much more than that. But this is expected in a short piece of writing. I am finishing my PhD from a UK university shortly on the concept of reflection in teaching and teacher education and so far have found reflection as an extremely complex and elusive concept which is often turned into a slogan for good practice. What, therefore, is needed is its understanding as a highly complex concept with multiple interpretations and models. I agree that “good” reflection is complex and difficult to acquire skills and strategies to gain the full benefits of the process. But having spent the last few decades working with pre-service and in-service teachers, I find that many engage in very limited or no reflection what-so-ever. As such, this is my call-to-action to have educators and their students at least think about what they are doing and learning on a meta-cognitive level. Yes I agree Jackie. You are right in that. Reflections are good if guided by good questions, at least at the beginning. It is a great way to reinforce learning and engage the student in some critical thinking at the same time.